Peppers blended with fruits and vegetables in spreadable, mouthwatering, sweet-hot flavor combos. The brain barraged with contrasting flavors is a happy one. These unique pepper jams, with their sweet and hot flavors, want your brain (and taste buds) to be happy. Walter and Nancy Warner blend peppers ranging from mild to hot with fresh fruit and vegetables to create mouthwatering synergies of scrumptiousness. 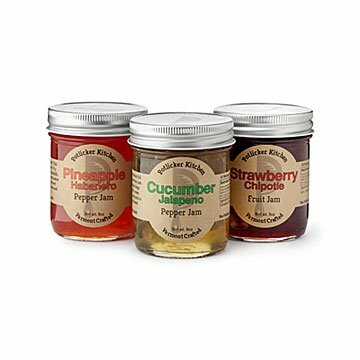 All three instantly add impressive depth and dimension to savory or sweet dishes, sauces, salad dressings, spreads, snacks, and drinks. Strawberry Chipotle: The juicy, fruity sweetness of ripe strawberries blended with the mild, smoky, heat of chipotle, for an addictive, all-day jam. Cucumber Jalapeno: Garden-fresh, cucumber-forward, this sweet and bright jam with a medium-hot kick, taste-kin to pickled jalapenos and spicy relish, is summer in spreadable form. Pineapple Habanero: This is the hot one, and we mean H-O-T. The floral-plus-fire flavor of habaneros mixed with red bell peppers and pineapples makes for a tangy, spicy, hot-with-a-little-sweet treat.